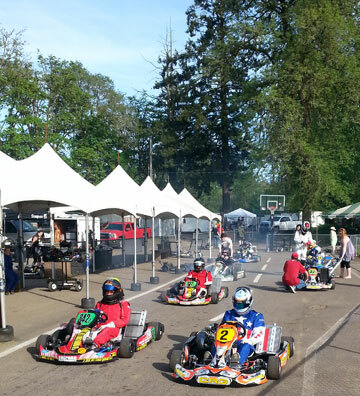 The Open 2-Stroke Championship was created to bring back the fun and participation in local kart racing. With a focus on making the fast 2-stroke classes affordable and open to nearly all types of 2-stroke engines, we are giving people a place to race competitively with either older “obsolete” engines, or the latest engines. Professionally run, but grass-roots focused, we welcome all levels of Karters from the weekend warrior simply looking to hangout with his friends and have a great time, to the semi-pro Karter looking for competition and track time to prepare for big events such as the SKUSA Super Nationals. This is a series that keeps costs to a minimum, and where camaraderie off the track and wheel-to-wheel competition on the track is the rule. "I had so much fun very enjoyable weekend you guys are awesome the prizes are great keep it up nice to see you doing it right"
The 2019 series is presented by WORD Racing. They are providing the funding for the medals, podium hats, website, banners, and much more (including many hours of organization, promotion and planning). Please visit their website at wordracing.com and support them. They carry the latest Snell standards helmets (from Arai, Zamp, and Pyrotect), 360 Plus Devices, Ribtect vests & seats, tires, oil, and much more. They are the NW Tony Kart dealer and also the Northwest distributor for the awesome made in USA iKart Indianapolis racing karts – double winner of the SKUSA Summer Nationals. Click link below for PDF document explaining class weights, fuel, tires, etc.